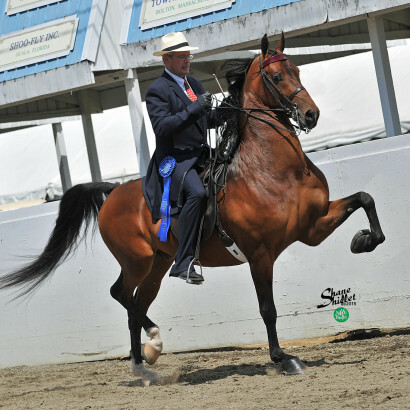 There was no shortage of excitement for Schengrund Stables at the 2015 New England Regional. Under the direction of Luman Wadhams, SSLLC Patent Pending (Dragonmeade Icon x One And Only) was a shining example of SSLLC breeding. Taking first place in the English Pleasure 3 yr old class, the flashy bay gelding impressed both the judges and spectators with his performance. We are confident there are going to be tremendous things from him going forward. Don’t miss him this October in Oklahoma! SSLLC A Royal Affair (HVK Man About Town x Futurity’s Touch of Harley) hit the ring shining and never looked back! Taking a close second in the English Pleasure Junior Exhibitor 13 & Under qualifier, this beautiful chestnut mare and rider Abigale Tate went on to take Reserve in the Championship. This dazzling mare proved she can compete with the best of them. Special thanks to Abigale on a wonderful ride and performance with this fun mare! The thrill continued for Schengrund Stables when SSLLC Stop And Stare (Serenity Masterpiece x SSLLC Colour My World) delivered a great performance under the direction of Amanda DuPont when she entered the ring in the Hunter Pleasure Ladies Mare class Wednesday afternoon. SSLLC Stop And Stare drew on-lookers attention and captured second in her large, competitive class. She then continued on to take third in the Hunter Pleasure Ladies Mare Championship with another competitive performance. A vivid reminder that when you purchase an SSLLC morgan the best is yet to come, we would like to recognize the recently sold SSLLC Cover Girl (Graycliff Tony x SSLLC Stop And Stare) who did us proud at NEMHS with victory passes in both the Hunter Pleasure UPHA Classic and the Hunter Pleasure 3 year old classes. This mare went on to take Reserve in the Hunter Pleasure Jr Horse Championship. It was another great performance by trainer and rider Amanda DuPont to bring home the ribbons. Sincere congrats goes to new owners Dana and Farley Peechatka on their success with this lovely mare! We would like to thank all those who participated and supported SSLLC during the New England Morgan Horse Show. Please take the time to check out SSLLC Patent Pending, SSLLC A Royal Affair and SSLLC Stop And Stare on our “For Sale” page, we would love for you to be our next victory shout out on our growing list of champions! As for Schengrund Stables, we are onto NY Regional!